Daily Messes: It's Almost Time for the Eclipse!! It's Almost Time for the Eclipse!! 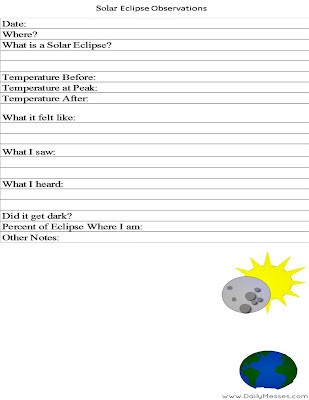 I love eclipses of any kind and meteor showers. I'm the crazy one who stays up late or gets up early to see the event, even if I have to be wrapped up in blankets. I try to capture it on camera, mostly missing the meteors, but I have gotten one or two. The last lunar eclipse I managed to get a few fuzzy pictures, and I dragged the kids up a hill for the last partial solar eclipse. It was really cloudy that day, so we didn't really get to see it very long. So, of course, I am really excited about the eclipse on Monday. We are not in the totality path, only about 92-93% coverage, but I am still really excited. Ok, not a solar eclipse. 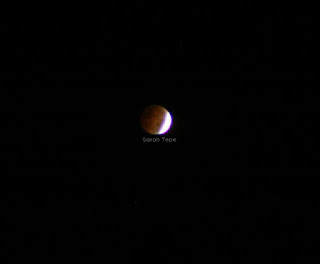 But it is the last lunar eclipse where I took a decent enough picture! 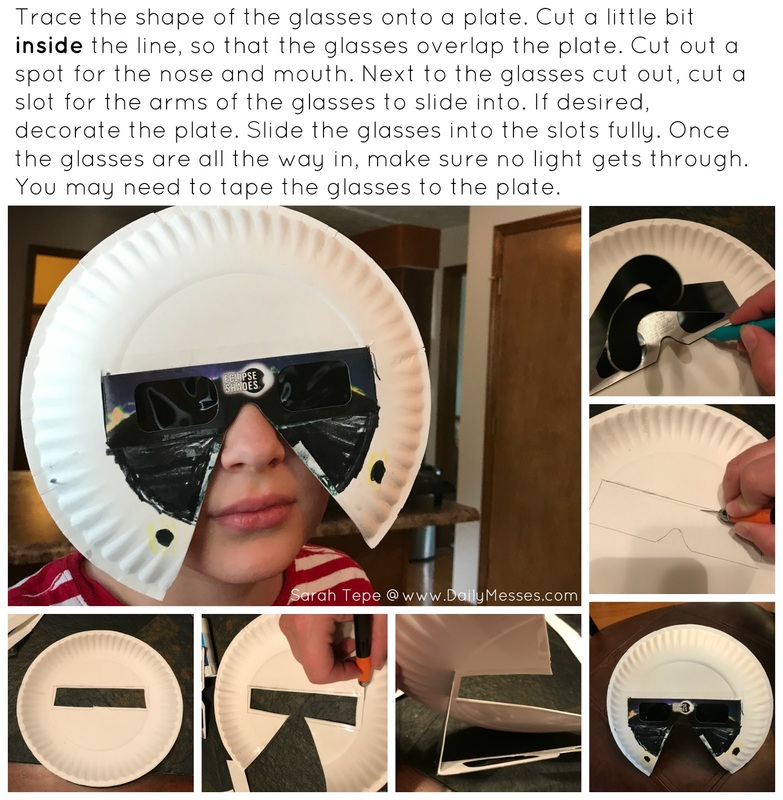 One of my favorite memories of grade school is making a solar eclipse viewer. I think it must have been for a partial eclipse. The memories of making the viewer and seeing it, have stuck with me through the years. I wish the boys' school was doing something for the event, but unfortunately only the older grades are allowed to view it. The rest of the school will have indoor recess with blinds drawn, although they can watch it on NASA's live streaming site. Luckily, I already had my solar eclipse glasses. They are sold out everywhere around here and online prices have skyrocketed. If you still want to experience the eclipse, but can't find any eclipse glasses, you can make your own viewer. There are two different types: the shoebox viewer and the pinhole viewer. Both will work, you just need to have foil and a shoebox for the one, and only white cardboard or thick paper for the other. Here are some sites with great instructions on how to make them: Shoebox viewer instructions, Pin hole viewer. Galaxy Cookies: Similar to my Christmas swirl cookies, but use blue and white dough. You could also lightly brush the outside of the chilled cookie dough with water, roll in purple/blue/white nonpareil sprinkles, slice, and bake, for an extra fun cookie. The sun or moon is pretty easy to add in icing or fondant to a cookie, cupcake, or cake. Cut fruits and veggies into star or moon shapes. The moon is made of cheese, right? Have cheese slices or make a cheese pizza (for your meat lovers, add pepperoni "craters"). Make solar themed chocolates (sun, moon, stars, etc.). Amazon has some cute molds (stars/moon, star candies, star lollipops, sun glasses aka eclipse glasses) although local craft stores like Michael's and JoAnn Fabrics usually have star molds. Galaxy/Eclipse Popcorn: Similar to the Valentine's Candied Popcorn, but use a mix of blues, purple, black, and white candy melt/chocolates. Use star, moon, and sun shaped sprinkles, or even just yellow sprinkles for the sun. Chocolate dipped Oreos (regular or mini sized). I'm working on dipping them today. I plan on making a display out of them: full sun (all yellow Oreo), partial eclipse (half yellow, half black Oreo), 90% eclipse (since that's about what we'll see), full eclipse (all black dipped Oreo). Instead of Oreos, you could also do it with round pretzels. Dip pretzel in melted chocolates or Candy Melts, set on wax paper, fill in the hole using a spoon or piping bag. Pancakes: Pipe pancakes in the shape of a sun (circle with rays). Ice cream: I've heard of Moon ice cream and Blue Moon ice cream. Krispy Kreme's Eclipse Donut, available Monday 8/21. Babybel cheese: peel off part of the wrapper. Mini Chips Ahoy: I think these kind of look like the moon with chocolate chip craters. Stretching it a little here, but Mars candy bars. I thought it would be fun (and educational) for the boys to have an observation sheet for the eclipse in case they got to see it. I couldn't find exactly what I wanted online, so I made one this morning! NOTE: If you are lucky enough to be able to watch the eclipse, never look at the sun without the special eclipse glasses or eclipse filters for cameras/telescopes/binoculars.